I was signed up to run the Rock 'N Roll DC Marathon in March of 2015. I even had a nice book that laid out an entire training plan for me. It was my first time actually training, as opposed to just going out for a run. I had a really good baseline fitness, so I felt good about the plan. I based my plan on a 39:47 10k I had run in December of 2014. I was about two weeks into my structured plan - the first week of doing an actual workout when I got injured. I was doing Speed 12x400m @1:30 on a treadmill at my office gym before work. I felt good doing the workout, but as soon as I stopped running, I had a throbbing pain in my knee. I ran once more that week, then took a week off, then I tried to string together a few consecutive days of 4ish mile runs to get back into things. I was then running sporadically until I went to see a physical therapist at the end of March, at which point I stopped running completely until July. Obviously I was not in any shape to run 26.2 miles. That injury set me back a lot. In December of 2015 I ran the Jingle Dash again, which was the race I got sub-40 for in 2014 and based my training plan on. My time in 2015 was 42+ minutes. Not slow, but a 4 month break clearly took its toll on me. I've been trying to get back to where I was at the end of 2014 ever since. 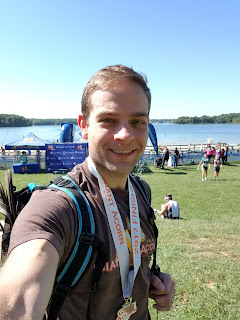 Of course, knowing that I was a dad, and would have to start caring for a newborn in January of 2016, I opted not to sign up for a marathon in that calendar year, since I had no idea what sort of training I'd be able to do. My wife has a degree in kinesiology, so she was adamant that I shouldn't run a marathon unless I was properly trained. Not wanting to suffer through, and potentially injure myself further, I was on board with her. Plus, baby! So while I didn't have any races planned in early 2016, and no formal training plan, I was able to get out there and just run. I'm big on heart rate training, which in a very simplified method means keeping all of my runs in the cardio zone to build a base. 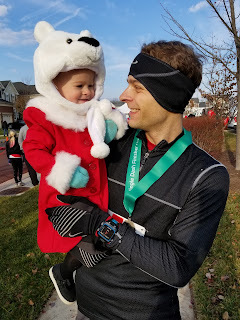 That method apparently did the trick to re-build my base and I'm happy to say that I ran the Jingle Dash in 2016 and beat my time from 2014 with 39:10. So this is what I used to set my training plan from Hansons Marathon Method. I'm now three weeks into the plan, having done multiple workouts and I'm still injury free. I haven't been able to get in every run, but I've been pretty close to it. It's upped my mileage to close to 30mpw on average, and I'm feeling really good during every single workout. I've actually felt extremely good with this workout plan. I was afraid that I was being overambitious when I first set out with the goal pace of a sub-three hour marathon, but every single workout has been manageable and left me feeling good after. At least, that's how I felt until yesterday, when I did my first 16 mile run of the plan. I was supposed to do a 16-miler two weeks ago as per the plan, but was relegated to a treadmill and could only muster 10 miles due to not wanting to lose my sanity. Prior to yesterday, the farthest I've ever run was a half marathon, so to do an extra three miles as part of a training run was a new experience for me. I was paced at 7:29, which is usually easy for me. Apparently, the alcohol and half a pizza I had eaten the night before made the run a bit tougher for me than usual. From the outset, I just had trouble keeping at pace, which is a really bad sign, because 7:29 is usually a cake walk for me (relatively). So it wasn't a surprise that I struggled through the entire run. I did manage to finish, but slightly below my target pace at 7:30. The entire time, my heart rate was exactly where I would expect it for that pace, but my legs just weren't in it. I was also really surprised at how physically exhausted I was after the endeavor. As in, all my body parts were sore and I fell asleep on the couch in the middle of the day. I guess I shouldn't be surprised - if I had just raced a half marathon, I'd probably be feeling similar, and this pace wasn't far off the last half marathon that I ran. The entire run was disheartening as it made me realize that I may not have it in me to run an extra ten miles at 41 seconds/mile faster pace. On the plus side, I have another month and a half of training, and I don't plan on sabotaging my diet the week leading up to the marathon. On the super plus side, my wife has been super supportive of my running. Even though Ellie is now a year old, and Jenny's Master's program just started back up again, I'm still finding the time to get out there and put in the miles. Sometimes it's early morning, sometimes it's after Ellie goes to bed, sometimes it's in the middle of the day (if I'm working from home).